Lucas Moura gets off lightly with a yellow card after a dangerous challenge on Phil Jones against Manchester United on Monday night. 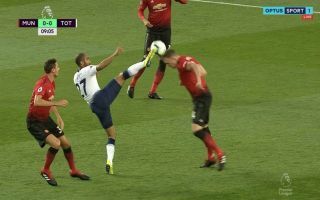 In what has been a highly charged opening to tonight’s Premier League clash between Man United and Spurs, the latter will consider themselves lucky to still have 11 men on the pitch after a shocking incident involving Moura and Jones. As the United defender went to head the ball he was met by the foot of the Brazilian winger, which was far too high and potentially could have done real damage, not to mention provoke the referee into sending him off. However, tonight’s official decided that a yellow-card would suffice, which could end up being a real talking point if this game ends up slipping away from the Red Devils. Optus Sport on Twitter posted an image of the nasty clash at Old Trafford, which you can see below. Lucas Moura yellow carded for a high foot.